Disturbing results of a baby shampoo study were released this week. Phthalates, which are prevalent in the majority of baby personal care products were found in elevated levels in the urine of infants after they had been bathed and pampered with products containing this chemical. Thus, the theory that we actually ingest what is put on our skin is proven for all skeptics. Phthalates have been linked to causing reproductive problems. The federal Centers for Disease Control and Prevention says the health effects in humans are uncertain. "Uncertain?" As parents we can't afford the luxury of uncertainty. We need to be aware of what is in our baby's products. A good rule of thumb is, if you can't pronounce an ingredient and/or don't know what it is, don't use it. *Note DEP and DEHP are also used to describe phthalates in ingredients. News like this is exasperating to some because it requires change. But change like this is easy and necessary. I have mentioned Burt's Baby Bee products before, which are widely available (check Target). We use the Baby Bee Shampoo and Wash, which is free of phthalates and all natural. 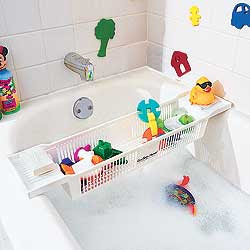 Bath time should be a time of relaxation and fun, so choose some great products and dive in!